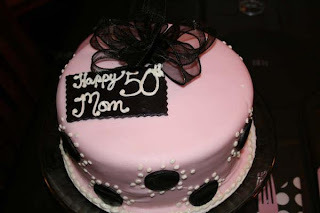 Moore Minutes: Sweet Pink and Bad Black: 50th Birthday! 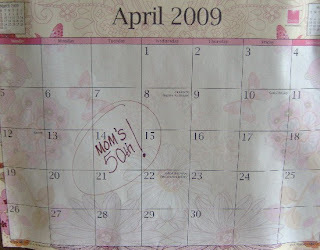 It was my Mom's 50th birthday the other day. 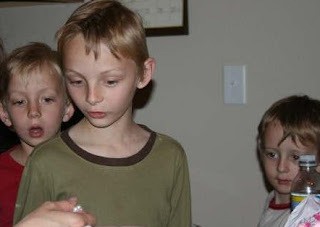 Wow, a variety of emotions swirl in my mind as I rewind the years in my head. My mom has lived an incredible life, living it very much to the fullest! She has blessed many people, especially her family. She is our foundation and we so enjoyed celebrating her LIFE with this bubbly party. 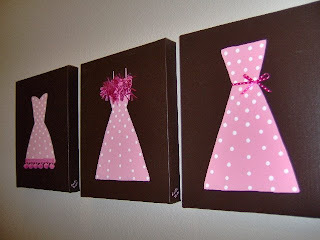 The theme was pink and black, and polka dots, with a splash of retro mixed with contemporary. 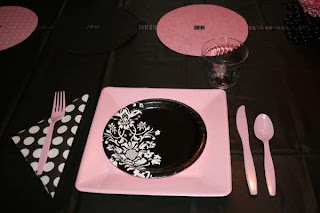 EVERYTHING was pink and black!! I made the table runner out of scrapbook paper pages and ribbon. I bought plastic cups and embellished them with scrapbook stickers. I also replaced the lightbulbs with 2 RED and 2 PINK lights to give a fun effect. 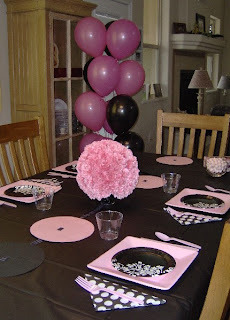 I made a round pink carnation (50 carnations) centerpiece (See this post here) and bought black disc marbles to decorate with as well. The marbles don't show up in the photos because of the dim lighting. We even planned for most of her gifts to be pink and black and retro. 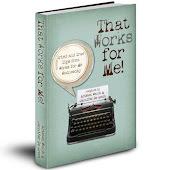 She got a black apron from Heavenly Hostess, (click here to see it). 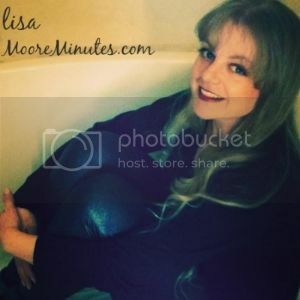 She received a lot of pink and black fragrances from Victoria's Secret, vintage bath products, a pink ice cream scoop, a classic pearl necklace, etc. 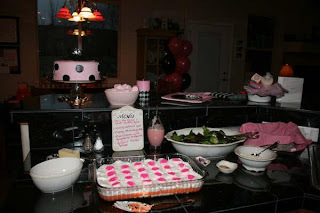 Even the food was pink! 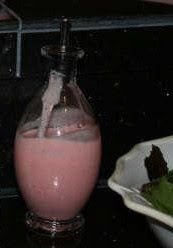 I made a fresh raspberry vinaigrette salad dressing that was pink of course. Also, a fruit jello/pudding that was pink(ish). 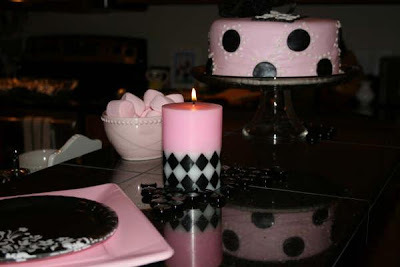 I cut pink marshmallows in round discs and put pink sugar on them to maintain the color and polka dot theme. 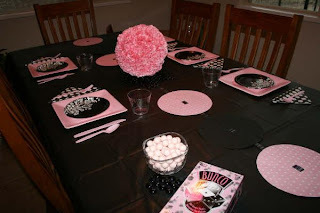 We had bowls of pink whopper candies and pink strawberry marshmallows too. And the cake was too cool! I got it from a local cake shop and it turned out lovely! 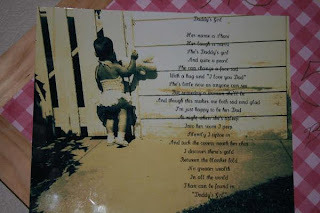 I had to add a sappy touch too...I got a photo of when my mom was little and I copied a poem called "Daddy's Girl" that my Grandpa wrote for my mom when she was little onto the photo to create a banner. 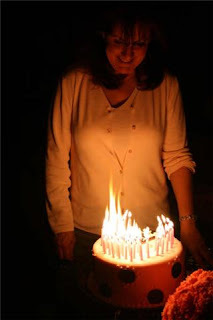 We all had an exciting evening, a perfect way to start her first day of being 50. How FUN!!! You did a great job planning it! 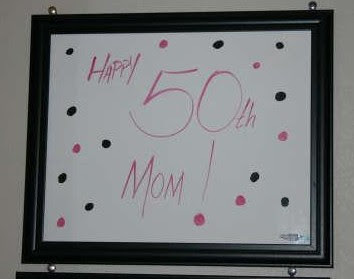 :) I wish I would have done something like that for my mom's 50th. I love Heavenly Hostess aprons, too! Cool gift! Belated happy birthday. 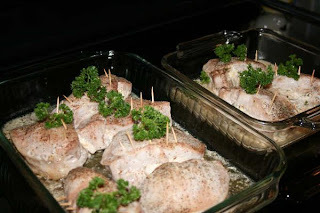 Food looks tasty. What a special event your planned...every detail was perfect! Fabulous party! You have some extra special touches that made this party look extra special! 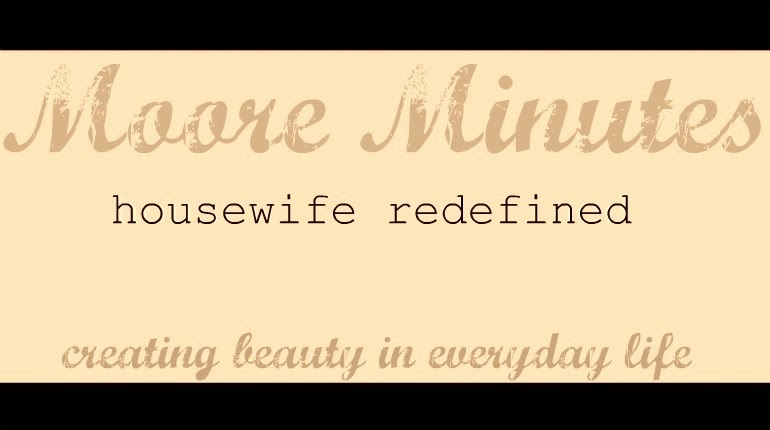 Thanks so much for stopping by my blog and leaving such a kind comment for my lollipop sweetness party. 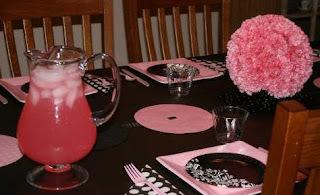 I'm so glad to be able to stop by and have a fellow party planner who is way into themes like me!! How sweet son you are!Your mom is very lucky to have you.